If you know anything about me, then you know my world revolves around music. I don't think there has ever been a day when I'm not making beats, blasting music in the whip going to work, working on a mixtape or just listening to music to relax. It's to the point that even when I'm not listening to music, it's still playing in my head. So with all of that said, it shouldn't be a surprise that outta all of the equipment in the lab, one of the things I use the most are my Beat Solo headphones. Now since the beginning of time, it seems that EVERYBODY and their moms trashes these headphones all day, everyday. And to be honest, I don't get it. I've heard the "they're not worth $200" hoopla and my response is neither are Jordans but cats are sleeping outside overnight to cop 'em right? Now, while most cats won't admit to this, I copped a pair of Beats cause they're just like a pair of J's. And what I mean by that is a pair of Beats is about fashion just as much as it's about listening to music. As much as cats front, the one things cats can't front on is they're probably the flyest headphones you can cop. 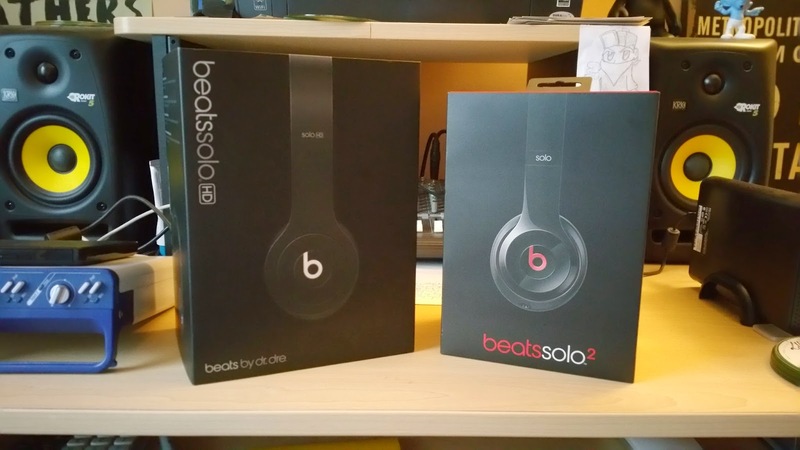 So, I got my first pair of Beats Solo's about 3 years ago and they've been good money for me ever since. Now, keep in mind that I'm no big audiophile head talking about the mids and lows hoopla. Nah, I'm just a dude who likes listening to loud music and the Beats Solo's give me that. Now, when it comes time to make beats and mix in pro tools, I'm strictly in my sennheiser bag but for my daily listening jones...yeah, the beats do me good. A minute ago while I was in Philly, I peeped that a new pair of Solo's dropped and since I always gotta have the newest thing on tap, ya'll know I had to cop a pair. And at first I was diggin' em, the sound quality seemed to be a 'lil better then the Solo HD's and they were built much better. In fact, they made my original Solo's look cheap as hell. Now, ya'll gotta understand that with me and my music jones, I can easily have my Solo's on for hours and hours and hours at a time. And that's exactly where the problem with these new Solo's come into play. See, after rocking them for a good 30-40 minutes my ears started throbbing. It's literally like the headphones were crushing my ears. So, I peeped a couple of reviews and I saw one of the main complaints were that they were mad tight. In fact one review said not to cop these if you're taking a long flight or watching a movie. Did money just say "you can't even rock 'em if you're watching a movie?" Now, this is where the $200 price tag becomes an issue for me. Cause if I cop a pair of J's for $200, not only should they be fly but more importantly they're damn sure should be comfortable. But I figured after a minute they would stretch but nah, they didn't. It got to the point that I actually started to stretch them nightly on my studio monitors but to no avail. The last straw was when I let my daughter rock 'em on a trip to Philly and after about a hour of watching a movie with 'em she said they were hurting her ears. Now with my original Solo's she could rock 'em on a 5 hour trip to NYC with no problem but now she can't even rock 'em to watch a whole movie? Yeah, these jawns gotta go back...but now what am I gonna cop? After having the 2's, it's gonna be hard to go back to the old Solo's cause the 2's look so much better. So, I figured I'd cop a pair of the Beats Studio but I learned my lesson from not doing any research on the 2's first so I started checking out the reviews before I dropped an extra $100 for 'em and I'm glad I did. Cats were saying that with the noise cancellation on the Studios that there's a constant buzz in the background which might be cool if I was sporting 'em while I was out in the streets but my Beats are strictly for being in the crib the bulk of the time. Plus I peeped that you gotta charge these for the noise cancellation to work and if the battery dies, the headphones die too which is wack so that was enough to do it for me cause I know me and there's no way I'm gonna remember to charge something else. And I'm gonna be pissed if I'm ready to listen to some music and I can't cause I forgot to charge them so nah...no haps. So, in a nutshell I had to go to back to the Solo HD headphones but copped the newer "drenched" ones then the original Solo's I copped 3 years ago. Yeah, they don't look as fly as the 2's but they're MUCH more comfortable and still sound dope so for the battle of the Solo HD's vs. the Solo 2's....I gotta rock with the Solo HD's this go round. My two cents is since Apple wants to charge Jordan prices for these headphones, they better start coming with some Jordan comfort too.